Working in production is a tough job. It can mean long hours of setting up lights, microphones and cameras just right—only to take them all down again at the end of the day. All that equipment is expensive and can be a chore to lug around, which is why it’s important to pack it up and transport it as efficiently and conveniently as possible. With the help of some very busy people in the production industry (they just never stop! 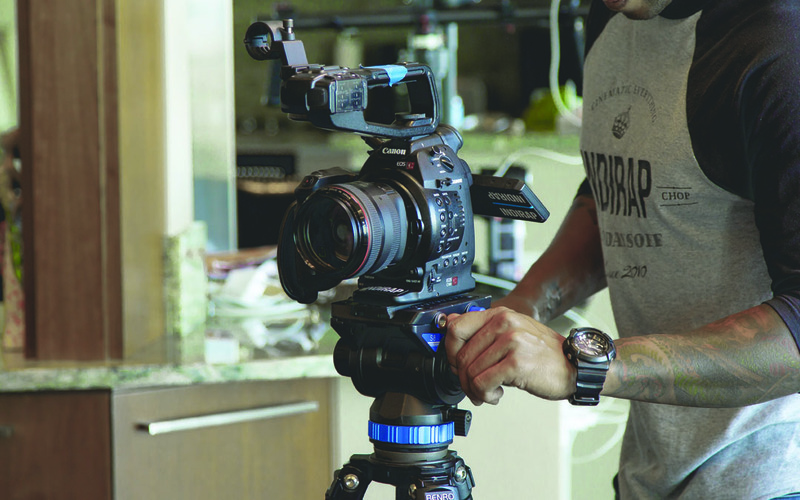 ), we’ve created this list of tips and supplies for production companies. Whether you’re training the new guy on how to move studio lights, or prepping an older home for a day of on-site filming, we’re confident it’ll help you stay organized. Don’t forget to download your FREE printable checklist for production companies below! Outfit everybody right, and your production days will move as smoothly as possible. Dressing Properly is the basis of a successful day. Judging what to wear based on weather and location can make the difference between a sluggish day and a breezy one. Sometimes you’re outside under the sun or rain, or stuck inside potentially with no air conditioning. Don’t forget those safety boots! Carrying The Essentials will keep your tasks moving swiftly—no one wants to go searching for tools or help. A tool belt full of the supplies you might need (like tape, wire cutters and a hammer) will serve your team members well. Don’t forget to keep a properly stocked first aid kit and lots of water nearby. Taking Breaks can be easy to overlook, but they’re key to staying energized and efficient throughout the day. Water, snacks and energy bars are quick, smart options for fueling up. Protecting Their Backs is job one for your team members. Without their health, they have nothing, and a strong back is central to that. A quality back support belt, worn properly, is important during a long day of moving and lifting heavy equipment around. Having everything properly packed and organized is the best way to keep your team on track. Plastic Bins are your best friend, ideal for packing up almost anything you’ll need while working on-set or doing on-location filming. They seal properly and easily, are weather-resistant and stack well for easy transport. File Storage Boxes for storing documents like blueprints and plans, manuals and schedules, as well as financial and insurance records. Corrugated Boxes such as stock or moving boxes for organizing and packing up excess supplies, or small tools and equipment needing to be out of the way, but easily accessible. Packaging Supplies like packing tape for sealing up boxes, coloured tape for organizing containers, markers for listing box contents, and bubble cushion or foam for protecting equipment that may not have its own specific case. No one wants to damage an expensive set—the right equipment can help your team avoid that. Dollies & Hand Trucks can easily move around set pieces or stacks of packed plastic bins. Carts can handle large or expensive equipment, often stacked or piled up. Forearm Forklifts and other carrying straps will make moving heavy objects around much easier. Shoe Covers/Booties add traction to shoes, preventing slips and falls, while saving floors from dirt, mud, and potentially damaging boot treads. Floor Runners will protect wood, laminate, tile and carpet from damage caused by boot treads and hand truck wheels. Moving Blankets are perfect for wrapping around equipment, furniture or set pieces, protecting them from possible damage. Corrugated Bulk Bins are great for collecting garbage or excess supplies while on-set. Get instant access to our FREE Production Companies Printable Checklist—and stay up-to-date on all the great content and products we have to offer! There’s a lot to do when it comes to collecting supplies for production companies. With our assortment of safety and support supplies, we’re confident The Packaging Company has what’s needed to make both your in-house and on-location days as successful as possible.